The group stage of the 2014 FIFA World Cup is now over. 32 teams traveled to Brazil hopeful of conquering the World, now just 16 teams remain. The last round of group stages were pivotal for 23 of the teams.The third round also saw a few less goals with 42 following the 49 from round 1 and the 45 from round 2. But as the dust settles as we face our first rest day of the FIFA World Cup, lets look back at who were the stars and disasters of the third round. There may have been less goals in this round of fixtures, but there were still some sublime goals. Lionel Messi’s free kick, James Rodriguez and Thomas Muller all run this one close, but the standout goal from Round 3 of the FIFA World Cup was from Swiss ace Xherdan Shaqiri. The Bayern Munich sometimes forgotten man slashed in one from 30 years that even had the decency to scrape in off the top bar. Not only did Shaqiri score one great goal, he netted twice more in the second FIFA World Cup hat-trick after Muller in round one. Shaqiri was outstanding in his ruthless display against Honduras. It would also be a reminder to other teams of the quality that Shaqiri possesses and his time on the Bayern bench might come to an end with more displays of top class quality. If Switzerland are to progress further in the tournament they will look to their young hit man to lead the line. Injury time arrived and Ivory coast were on the verge of progressing from the group stage for the first time in history. But Greece forward Giorgos Samaras was lining up to take a shot from around the penalty kick spot in the 91st minute when his kicking leg caught the inside of Ivory Coast defender Giovanni Sio’s leg. That caused Samaras’ foot to get stuck in the turf, and he lost his balance. The officials awarded Greece a penalty kick, which was converted with class by Samaras. Heart break for the Africans with a call that definitely divided Social Media. 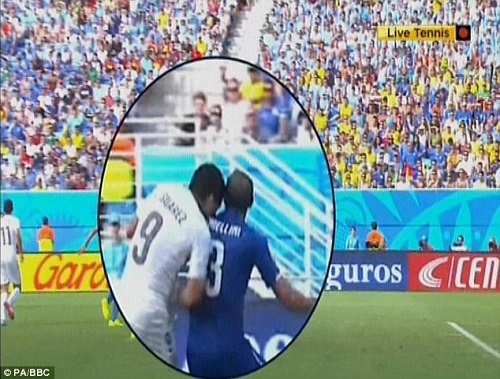 There is not much I can say about Luis Suarez that hasn’t been said somewhere on the internet. Suarez once again showed that for all his untouchable skill, his own temperament is stumbling block to his defining towards greatness. His four-month ban is harsh in my opinion and not harsh enough in others. But this was the third time in his career that he has bitten an opponent. There is something wrong with Mr. Suarez and his inability to learn from the failings of his past is something that is both troublesome and disappointing. It’s at times like these that I am happy Liverpool did not accept Arsenal’s bid. Mexico were seen by many as underdogs to Croatia in this game, Mexico showed great class in a demonstration of patient football. They defended with heart and style to hold Croatia out for the opening 70 minutes before the old man Marquez did it again and put Mexico ahead. Guardardo and Hernandez then secured passage from Group A before a late Persic goal finally breached Ochoa’s line for the first time. Mexico face a tough game against Holland in the next round, but the way this tournament has run, don’t be surprised if Marquez and co move on to the Quarter Finals in what would be a huge surprise. This round did not quite produce the upsets as expected. But Ivory Coast were everybody’s favourite for this game against a Greek side who seemed incapable of scoring goals. Greece produced a fine display of football and dominated this game with surprising ease. When Ivory Coast leveled, Greece kept pushing forward and looked capable of snatching the game, which the ultimately did in controversial circumstances. A great performance by Greece to make it out of the group stages for the first time in history! The game of the round was one where both teams seemed to forget the importance of defense as a match that flowed at an incredible pace and produced 27 goal attempts. 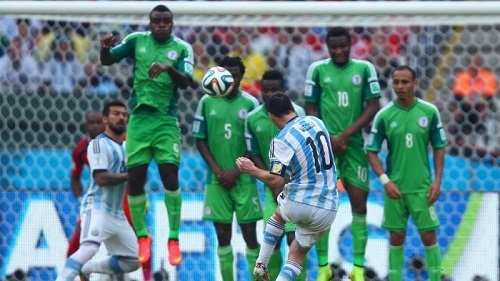 Argentina led as early as the third minute through Messi, but Ahmed Musa equalised within 60 seconds. Messi then produced the sublime by scoring a beautiful curving free kick on the stroke of half time. Nigeria started the second half like African champions as Musa completed his brace with a fine goal. But the 50th minutes saw the winner as Marcos Rojo got hit by the ball as it progressed into the Nigerian net. Enyeama then produced some high quality to keep Argentina out and to give some confidence to the African team for the latter stages. What a game!